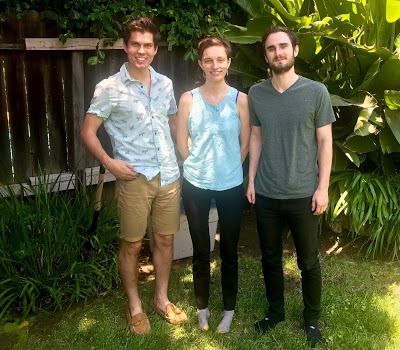 Last week I had the pleasure of meeting Embodied Labs CEO, Carrie Shaw, and her team at their Los Angeles working-home. As we sat on the back patio sipping coffee, she told me the story of her vision of using virtual reality to bring understanding of the patient perspective to the millions of caregivers and healthcare professionals working with our aging population. That vision has brought her team from the relative safety of graduate student life in Illinois, to the wild-west hub of VR/AR start-up activity in Los Angeles. As Embodied Labs celebrates their first birthday this month, Carrie and her co-founders which include Ryan Lebar, Creative Director, Thomas Leahy, Lead Developer, and Erin Washington, Head of Curriculum Design, are celebrating by launching a new 360° video documentary At The Peripheral. “I was surprised at how much of the process of capturing the documentary footage was dependent on relationship building. Not knowing anyone with macular degeneration personally, Ryan and I started attending Chicago community events for people with low vision. We happened to run into Tom at one of these events and when we shared our vision for the piece with him he immediately agreed to invest his time into working with us. He even held our 360° camera as he rode his bike through the streets, narrating what he was seeing and how he was able to ride despite his impairment. 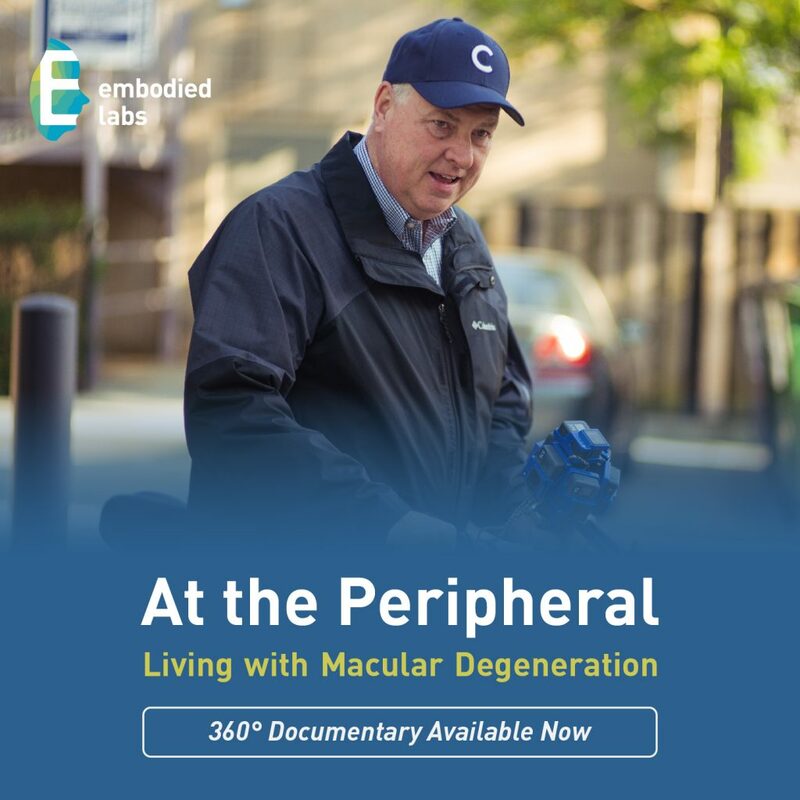 At The Peripheral tells the story of Tom Perski who has macular degeneration. During my visit with Embodied Labs, I got to preview an early version of At The Peripheral. Using an Oculus Rift headset, I entered the world of Tom Perski. Tom was a 22-year-old student athlete who was unexpectedly diagnosed with juvenile macular degeneration. The 360° experience shows what Tom has done with his life since the plans he envisioned for his future changed so drastically. 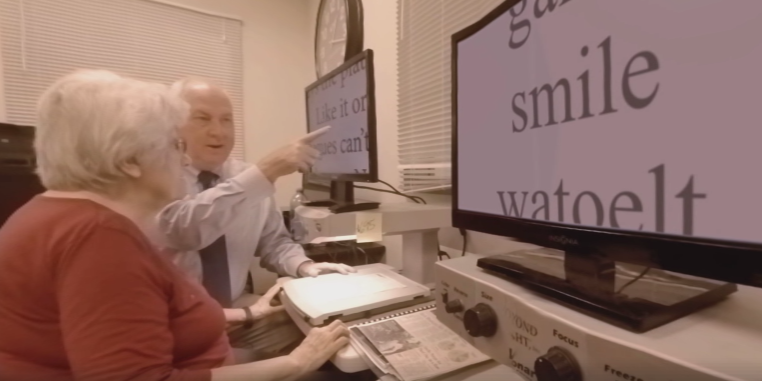 Today, Tom is Vice President at a renowned vision rehabilitation center where he connects people with vision impairments to emerging technologies that help them hack their vision. The experience allows the viewer to see Tom interacting with people as part of his new role. And it also takes the viewer into the clinical setting to better understand the patient-physician dialogue during diagnosis. 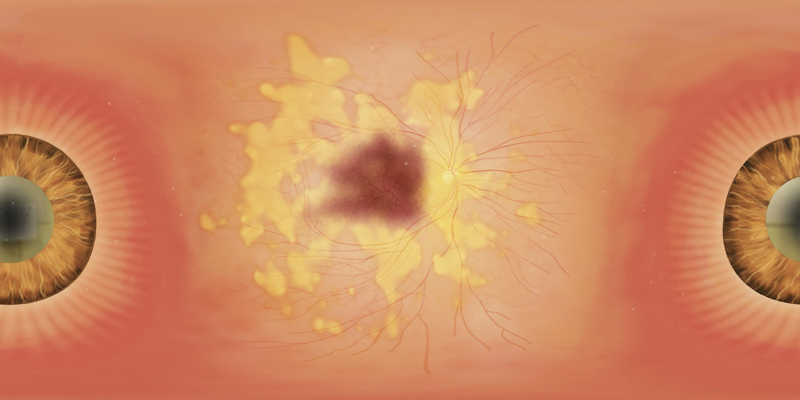 In the scene where the optometrist is explaining Macular Degeneration to Anita, we wanted to use her dialogue, but do a 360° animation inside an eyeball to show the disease process unfolding at the micro level. Combining live action film and an entirely CG medical animation together made for some interesting design challenges. How do you transition from the live action scene into the eyeball? What sounds represent things like growing and leaking blood vessels? Eva Mae Baucom, our medical illustrator, had to decide where to show labels of different parts of the eye’s anatomy and how to show the effects of the disease in 360° from a view inside of the eyeball. At The Peripheral is yet another moving piece of storytelling from Embodied Labs. By encouraging viewers to “embody” the life of a patient to live their story and see their needs, viewers leave the experience with a better sense of empathy and understanding. At The Peripheral and We Are Alfred are available for clinical education and training. To schedule a demo or find out more information on how Embodied Labs can help you, visit their website or contact Carrie Shaw. Embodied Labs is featured on our infographic Your Human Journey: A Prescription for Virtual Reality. Check it out! 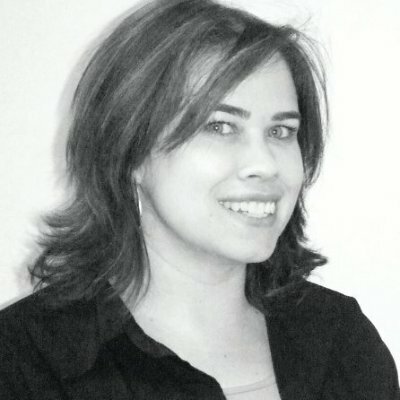 Kristi is the founder of healthiAR and is passionate about the impact virtual and augmented reality will have on healthcare. Visit her at getkristi.com. 1 Community thoughts on "Embodied Labs Launches VR Documentary: At The Peripheral"